Small update this time! I’ve added Coppia: Maid Cafe of Love to my list of freelance edits. Additionally, all Friday, I’m running a contest where anyone who RTs this tweet is entered for a chance to win one of my patented Free Stuff Friday packs. My review of FUNimation’s release of Tokyo Ghoul Season One is up at toonzone. Nothing major, but I added The Stargazers and The Menagerie to my list of freelance edit works (both visual novels). 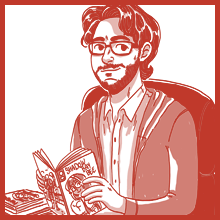 Thanks to the amazing work Kelly Leigh Miller does for subscribers of her Patreon, my comic-organization page (The CHaDLY System) has a nice big picture of me. Not much here, but I added Girlfriends Galore to my list of freelance edits. Just an update to let you know that my review of RE:Cyborg 009 went up at toonzone. New year, new focus on posting stuff online. No real introduction, but here’s the meat of the matter. An early draft of my CHaDLY System of Collecting Comics is up. It’s not finished and signed off, but you can get a look at it and toss me some some suggestions if you want. You can download a free copy of The Shadow Bay Bee Issue #1 (complete with Presider back-up story), or go see some of the art I’ve collected of the characters in it. Do you watch a bunch of tokusatsu? I’ve crafted these checklists for you to easily remember what you’ve seen and what you need to track down. I’ve posted a complete list of my freelance editing credits. Since it’s a Friday, I’ll be running a Free Stuff Friday contest on my Twitter. Retweet or quote this tweet for a chance to win. For the launch contest, three winners will be chosen at random to receive a grab bag of comics, DVDs, and maybe more. I’ll pick the winners from entries posted by midnight EST on Friday sometime on Saturday.